Primary goals of both the National PTA and Illinois PTA are the adequate funding of education programs. The National PTA puts funding front and center in the 2017-18 Federal Public Policy Agenda Checklist with a call for a regular appropriations process replacing the current practice of sequestration “with a balanced approach to deficit reduction that does not further cut education funding and invests in key programs.” One current initiative is the Stop Cuts to Classrooms campaign. The Illinois PTA Legislation Platform addresses education funding that is “adequate, equitable and sustainable.” Item 2 of the Platform addresses tax considerations by calling for revision of the revenue article of the state constitution, legislative revision of the taxation processes, new sources of revenue which might expand the sales tax base, modifications of the existing taxation processes, appropriation of taxes to best meet the needs of Illinois citizens, removal of unjust tax limitations on unit districts, and removal of the limitations on bonding power of school districts. Why? To provide the best possible education for every child in every public school in Illinois. Without adequate, equitable and sustainable funding, Illinois will continue to lag behind much of the nation in providing the kind of education our children deserve. Currently, one of the hottest topics in the Illinois legislature is the revision of the school funding formula, Senate Bill 1 (SB1), which was passed by both chambers of the Illinois legislature. The Governor issued an amendatory veto to the bill, which the Senate has overridden, and now the fate of SB1 is in the House as of this writing. Our Legislation Platform allows us to take a position to support SB1. The National PTA provides its most current legislative priorities in its Federal Public Policy Agenda found at www.pta.org under the Advocacy menu. The Illinois PTA Legislation Platform is on our website in both full and brief form at www.illinoispta.org under Advocacy. Want to know more? Go to the Illinois PTA website advocacy page. Be a champion for children, join the Illinois PTA Takes Action Network, and join us in Springfield to be a part of “advocacy in action” on November 14, 2017. Want to know how positions of the National PTA and the Illinois PTA align on advocacy issues? Over the next several months, we will be providing you with information on the Public Policy Agenda of the National PTA and offering insights into how the Illinois PTA Legislation Platform fits into advocacy efforts at the national level. This bi-weekly series of articles will identify the current National PTA Legislative Checklist and highlight the corresponding areas of the Illinois PTA Legislative Platform. The checklist identifies areas that the National PTA will bring to the 115th Congress, and you may be asked to contact your federal legislative members urging them to take action on a particular item on the checklist. Currently, the Stop Cuts to Classrooms campaign is underway and, if you are part of the Illinois PTA Takes Action Network, you will receive a Call to Action through the Voter Voice system. At the state level, we follow a series of legislative initiatives that are addressed in our adopted Legislative Platform. Again, you may be asked to contact your state legislative members through Calls to Action. These calls provide you with a prewritten letter that you can edit or send as is, and responding only takes a minute or two of your time. Your voice matters—both in Washington, DC and Springfield, IL. Please join us and be a champion for children. Last week, Governor Rauner issued an amendatory veto of Senate Bill 1 (SB1) that significantly changed the provisions of the bill to the point where the Illinois PTA cannot support the amended version of the bill. As a result, Illinois PTA is calling for members to contact their legislators to override the governor’s veto. Here’s what you need to know about the governor’s veto. What’s the process for the General Assembly to deal with the governor’s veto? The Fix the Formula coalition, of which Illinois PTA is a member, has an informative flow chart that explains the process for the General Assembly. 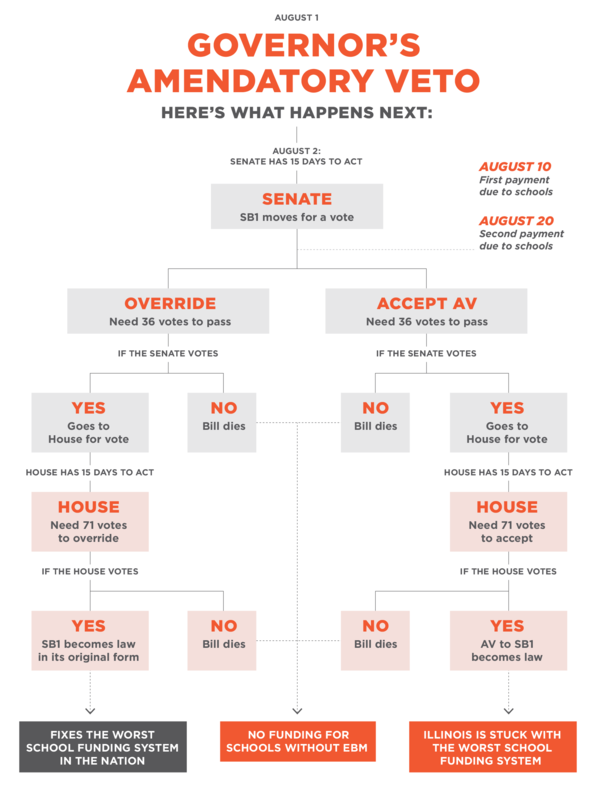 The veto starts in the Senate, where senators must vote with a 3/5 majority (36 votes) to either override the veto or concur with it within 15 days. If they can’t get a 3/5 majority, the bill dies and schools will not receive funding until a new evidence-based funding model (EBM) bill is passed. Since such a bill would be passing after May 31 and take immediate effect, it too would require a 3/5 majority to pass. If the Senate votes to override or concur, the bill then moves to the House, where again a 3/5 majority (71 votes) is needed to pass whatever the Senate voted to do. That means that if the Senate votes to override, the House cannot vote to concur, only override as well. If the House can’t get a 3/5 majority, the bill dies and schools don’t receive funding. If the House agrees with the Senate to override, the new funding formula would be installed, schools would receive funding with the new formula, and Illinois would begin to close its worst-in-the-nation inequitable school funding. If the General Assembly concurs with the governor’s veto, the vetoed version of the bill will become law, and many of the current funding problems would continue or get worse. Will my school open on time? Probably. School districts should have some cash on hand to start school, but some districts may not have much in reserve to keep the doors open. Some districts have said they have enough reserves to stay open for the full year, others have said that they can last until around Thanksgiving, and some are struggling to the point where they are already limiting payments to payroll, electricity, water, and other costs needed to keep the school open, but are not purchasing items like pens, paper, or workbooks. Illinois is also behind in some payments from last year to school districts, which has put a strain on many of them, and without an EBM in place, funding for this year cannot be sent out. SB1 is the only EBM that has passed both houses of the General Assembly after four years of negotiations and compromises. No other EBM bill has even been through committee at this time. School districts are due their first payment of the year on August 10 and their second one on August 20. The Illinois State Board of Education (ISBE) and the comptroller’s office say they will need about 10 business days to run the evidence-based model to calculate how much each school district will receive before they can cut the checks. That means that those first two payments will likely be missed while the General Assembly attempts to override or concur with the veto. It is unclear if or how the state will handle those missed payments. They could make them as soon as an evidence-based model is passed into law or pro-rate the missed payments into the remaining payments for the year. Complicating matters is that the comptroller can’t write checks first for the districts that are struggling the worst. All of the school districts must be paid at the same time, which also means that the state has to have the cash on hand to pay all the schools at once. I’ve heard my school district will get more money from the governor’s veto. Others say we’ll get less. Who’s right? That’s hard to say, because ISBE has not yet calculated how much school districts will receive under the model created by the governor’s veto. The numbers showing your district receiving additional funding are likely from other proposals that were not passed by the General Assembly. The governor’s veto eliminated the block grant for Chicago Public Schools (CPS), which is used by CPS to pay for special education, transportation, and other “categorical” spending. Eliminating the block grant cuts just over $200 million from CPS and parcels that money out to all the other school districts in the state, so other than CPS, district may see a bit more money initially. But other changes the governor made to the bill will likely cost every school district money in the long term. One of the key designs of SB1 was that no school district would lose funding from its current level. The governor’s veto breaks that by cutting CPS’s funding. How does the governor’s veto hurt school district funding in the long term? Eliminates inflation indexing of costs in the SB1. This was one item Illinois PTA specifically asked for in our testimony in May. SB1 calculates how much money a school district needs to educate a student on a variety of factors, and many of those factors have a set dollars per student amount in the bill. Without accounting for inflation, those values will essentially be cut over time just like an apple doesn’t cost a nickel any more. That means school districts will see cuts in funding even as increasing technology use in the classroom and inflation increase the real costs of educating a student. Changes the hold harmless provisions. One item critical to Illinois PTA’s support of SB1 was that no district would lose state funding from its current level—the hold harmless provision. The governor’s veto changes the hold harmless provisions from per district to per pupil in the 2020-2021 school year. That may not sound like a big change, but for school districts that have declining student populations, it means they will see less funding even if they are far from being adequately funded by the state. Fix the Formula has an interactive map that lets you see which districts would be affected by this change, almost all of which are outside the greater Chicago area. Includes TIF districts and PTELL in the properties in the calculation of school districts’ ability to raise money. School districts raise money through property taxes by taxing the Equalized Assessed Value (EAV) of the properties in their district. Tax Increment Financing (TIF) districts remove the value of properties in those districts from school property taxes, so schools do not get any taxes from those buildings. PTELL is Illinois’s tax cap law that limits the ability of school districts (and others) from increasing the total amount of taxes collected to the rate of inflation, even if the value of the property in the district has increased faster than inflation. SB1 recognizes the fact that school districts can’t get some tax money when calculating how much they should be raising to pay for themselves. The governor’s veto includes those TIF properties and ignores the PTELL limitations when making that calculation, so it looks like a school district can raise more money through property taxes and thus needs less state funding. The Fix the Formula interactive map also shows which districts have TIF and PTELL issues (select it in the “Indicator” drop down box). Moves the CPS pension adjustment out of SB1 and into the pension law. Under SB1, every school district’s pension payments were treated the same way. The state would pick up the normal (current) cost of pensions, including CPS who currently pay for their own pensions, but keep CPS responsible for its legacy (unfunded liability) pension costs. SB1 did recognize that CPS can’t spend the same tax dollar twice, once for legacy pension costs and again in the classroom, so those legacy costs were cut from the calculation of what CPS could raise through taxes, but did not give CPS any money for those costs. This also protected the funding of every other school district if the state were to make them responsible for their own pension costs, as has been considered in recent years with the state’s financial difficulties. The governor’s veto essentially takes money from the classrooms in CPS to pay for pension costs and will do the same for all other districts should they become responsible for their own pensions. Caps regional wage differences. SB1 put in a cost adjustment calculation to account for regional differences in salaries when calculating the amount of money needed to educate a student. SB1 has a floor for this adjustment to ensure downstate districts with low costs of living could compete with and retain high-quality teachers without wealthier districts outbidding them. The governor’s veto also adds a ceiling to this adjustment, meaning that districts with higher costs of living are penalized by artificially decreasing salaries. As the Fix the Formula interactive map for regionalization shows, this change would cost CPS and districts in the Chicago suburbs. Illinois PTA believes that these changes by the governor’s veto fundamentally change the basis of the evidence-based model. The veto removes the protections that no school district will lose funding from current levels going forward, which is a critical reason for Illinois PTA’s support of SB1. Illinois PTA cannot support a school funding bill that cuts funding to any district, nor will we support a bill that uses vouchers, even under the guise of “scholarships,” to divert public education funding to private and parochial schools. Illinois PTA is asking everyone to contact their legislators to encourage them to override the governor’s amendatory veto of SB1. It takes only a minute or two to use our prewritten letter. All you need to do is type in your signature to the letter, and provide your e-mail address, zip code, and street address to identify your legislators and provide them with the ability to contact you (usually just a “thank you for your letter”). Today, Governor Rauner vetoed part of Senate Bill 1 (SB1), which would have fixed Illinois’s inequitable school funding formula. Key elements of Illinois PTA’s support of SB1 are that no school district receives less funding and that all school districts are treated in the same manner regarding current (but not legacy) pension costs. The governor’s veto breaks both of those requirements, puts education funding at risk, and means that some schools may not be able to open for the start of school or remain open for long. The governor’s veto ends the district hold harmless provisions in the 2020-2021 school year, removes the minimum funding requirement, continues to treat Chicago Public Schools’ pensions differently than those of every other district, and eliminates the CPS block grant used to pay for special education, English language learners, and other “categorical” spending. The veto also eliminates the inflation indexing of formula values in the bill, meaning that districts will effective see funding cuts over time as inflation reduces the value of that funding. The governor has called SB1 a “bailout” for Chicago Public Schools. It is not. 268 school districts, over 30%, will receive more funds per student than CPS. Downstate students make up about 34% of all Illinois students, and about 34% of the SB1 funding goes to downstate districts. CPS accounts for 19% of Illinois students, one-third of our low-income students, and receives about 20% of the SB1 funding. SB1 now goes back to General Assembly for an override vote to restore SB1 to its original language or a concurrence vote to accept the governor’s changes. Either vote requires the support a supermajority (60%) of legislators in both houses. If neither the override or concurrence vote receives that supermajority, the bill is completely vetoed and schools will not receive funding until a new evidence-based funding model is passed by both houses and signed into law. We have seen the damage done over the past two years without a state budget to our community colleges, our universities, and our social services. Let’s not cut off funding from our schools by playing students from one zip code against another to score political points. Let’s put SB1 into law. Illinois PTA is issuing a call to action, requesting its members to contact their legislators to override the governor’s veto. Following this link will take you to a prewritten letter that you can edit or send as is to your state representative and state senator. It takes just a couple of minutes. Speak up for your child and every child in Illinois so we can fix our funding formula and keep our schools open.